NASA’s InSight (Interior Exploration using Seismic Investigations, Geodesy and Heat Transport) lander has arrived safely on the Martian surface after a seven-month journey. 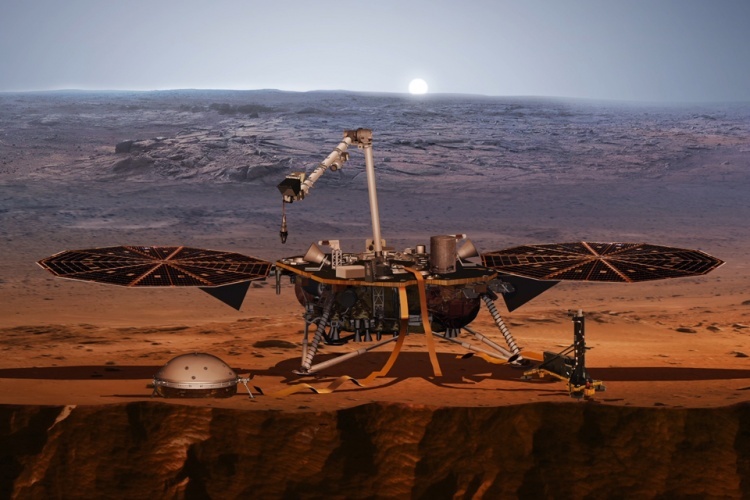 Having launched from Vandenberg Air Force Base in California in early May, the lander touched down on Mars on Monday, November 26, with a signal relayed back to Earth confirming the landing at around 2000 GMT. Another signal at around 0130 GMT indicated that the lander’s solar array had been successfully deployed. InSight’s landing zone is a flat area of cooled lava near the Martian equator called Elysium Planitia. The robot’s two-year mission will see it drill down into the surface of the red planet to investigate how rocky planets – including Earth – and moons are formed. InSight carries three instruments designed and built in the UK as part of its seismic package. These microseismometer sensors were developed by Imperial College London and integrated with electronics built by the University of Oxford. Over the course of the two-year mission, scientists expect to detect anywhere between a dozen and a hundred tremors up to 6.0 on the Richter scale using this equipment. 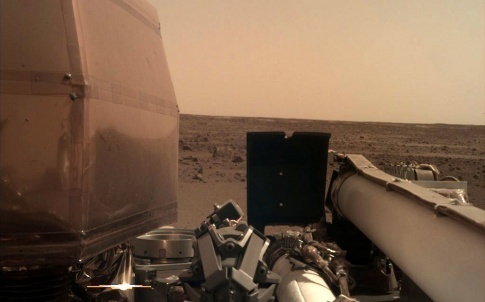 Following its 458-million km journey, InSight had to reduce its speed dramatically as it entered the Martian atmosphere. As the average time it takes to communicate between Earth and Mars is around 12 minutes, the lander was required to perform an intricate sequence of pre-programmed manoeuvres as it geared up for touchdown. The signal that confirmed the successful landing came via one of two experimental Mars Cube One (MarCO) CubeSats, which were part of the same launch payload as InSight. The MarCO twins are the first CubeSats to operate in deep space, relaying InSight’s entry, descent and landing (EDL) information back to Earth. While the lander’s mission was not dependent on the CubeSats, their successful deployment augurs well for the use of small satellites on future deep space missions. InSight’s twin solar arrays are each 7′ (2.2m) wide and provide 600W to 700W on a clear day, enough to power a household blender. Their design is based on the panels used by NASA’s Phoenix Mars Lander, though InSight’s are slightly larger in order to provide more power output and to increase their structural strength. These changes were necessary to support the planned mission duration of 709 Martian sols (two earth years). Wonderful achievement: I do not in any way wish to appear to be frivolous but someone remind me how long (several years?) the entire Biscuit farce has been going already, and what has it achieved? Great applause and affection for our fellow Engineers and technologists and great anger at our apparent leaders and betters who could not organise the proverbial! Just amazing. Even if the private sector puts a man on Mars first, it was NASA which broke the path and paved it with concrete. Congratulations to all concerned with this project, a huge achievement. One question; can the solar panels be cleaned after a dust storm?